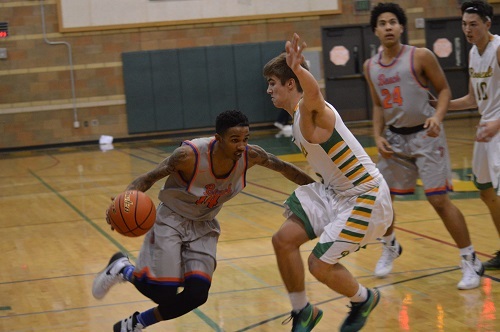 The first Tuesday of the new year featured a full slate of hoops including a Metro League matchup between the high-flying Vikings of Rainier Beach and host Roosevelt. The game opened with an explosive first half by Beach which put them on pace to reach 100 points in the contest. Sam Cunliffe and Kevin Porter recorded ten and nine points respectively in the first quarter alone. Roosevelt’s Jonathan Lang countered with 9 of his team-high 19 points in the first frame. However, despite Lang’s efforts, Rainier Beach’s suffocating defense continually forced turnovers which led to fundamental buckets in transition. The margin grew wider in the second quarter when Cunliffe finished at the rim with a pair of two-handed slams. N’Keil Nelson joined the dunk show with a baseline rim rocker of his own before the break. Roosevelt would need more Dylan Jacobi threes and Lang jumpers if the Riders were hopeful in erasing the twenty point hole at halftime. Mike Bethea evidently emphasized the defensive success in the first half because the Vikings tightened the clamps even more in the third quarter. Rainier Beach only allowed seven points in the frame and increased their lead even further. Khalil Shabazz recorded half of his dozen points in the quarter and Beach was able to cruise to a comfortable road victory despite a valiant effort shown by the Riders until the clock hit triple zeros. 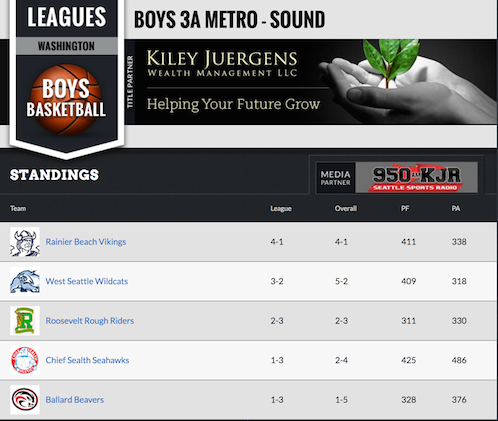 Rainier Beach 83, Roosevelt 44.